3/28/2007Share this story on Facebook! Read about more of IC's talented theater grads. 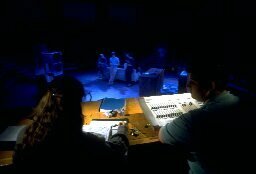 From set design and construction, to costumes and makeup, to the pit orchestra, to marketing and promotional efforts, it takes hundreds of hours and dozens of dedicated people to prepare any mainstage production for opening night. Matt Cavenaugh ’01 ›› Actor; originated the role of Bud in Urban Cowboy; currently featured in Grey Gardens on Broadway. Eric Jordan Young ’93 ›› Actor; featured on Broadway in Chicago, Dessa Rose, and Seussical: The Musical; currently touring in his one-man show, Sammy & Me. Blood Brothers, Les Miserables, and as Belle in Beauty and the Beast. Tony Meola ’76 ›› Sound designer; winner of a Drama Desk Award for sound design for The Lion King; Broadway shows include Wicked, The Wild Party, Sweet Smell of Success, Footloose, Moon over Buffalo, The King and I, A Funny Thing Happened on the Way to the Forum, and She Loves Me. Kevin Greene ’06 made it into the top five finalists on the hit NBC reality show, Grease: You’re the One That I Want. Greene starred as Kenickie in the College’s production of Grease in 2005. Check out the Department of Theatre Arts notable alumni page for an impressive list of Ithaca-trained talent.